It was not the time for the clouds to scud quickly out of sight and the sun to make a heated comeback. It threw its harsh, unrelenting rays across the courtyards of Bangkok’s Grand Palace, homing in on our heads and zapping us with its death rays one by one. After a minute of walking, I was already bathed in sweat, my mouth turned down into a grimace and my face resembling that of a yaksha, a Thai demon, lifting a golden slab of whatever. It was decided earlier in the day that we were gonna leave the comfort of Bangkok’s Sofitel So to see just what exactly the city has to offer in terms of temple runs. 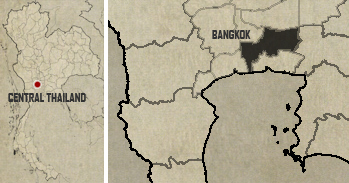 We checked the major temples, crossing out lesser known ones, until finally, there’s only one left. 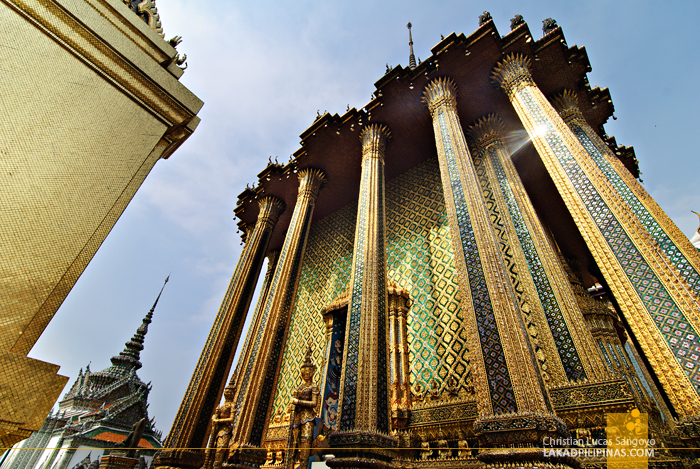 The Grand Palace. So off we went, in slippers, shorts and singlets (Same Same But Different). It was just too darn hot in Bangkok that we wore the most comfortable clothes we could find. And that’s what made us buy extra pants and scarves outside the Grand Palace as soon as we saw the sign posted on its gates; no skirts, no sleeveless shirts, no shorts. We could’ve rented some clothes near the gate, but we have to go all the way back just to get our deposits back. Too much trouble for a few baht (my friends are rich). 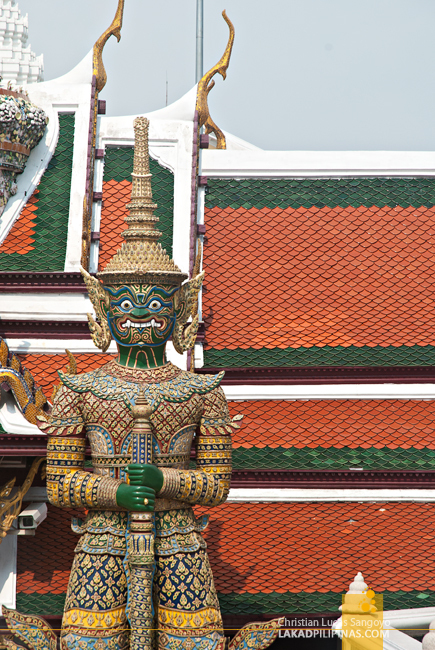 Finally ready to enter the temple grounds, we coughed up the required 500.00 baht (15.00 USD) and jostled in with the throng of tourists visiting the Grand Palace that day. From the outset, I knew I’d have to be very patient in taking photographs as severed tourist heads kept popping up on the lower part of my frame. 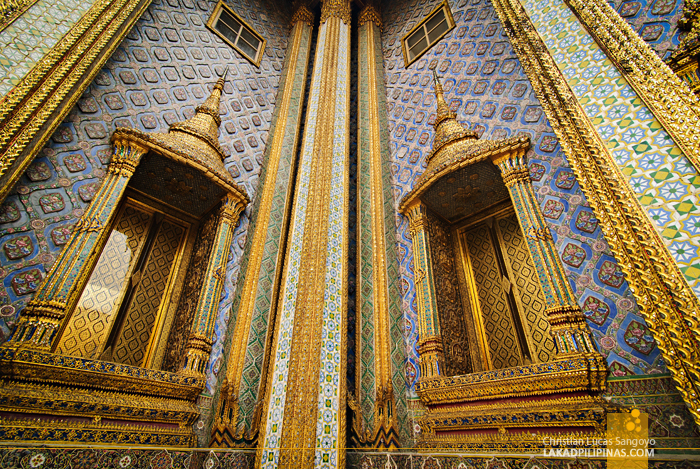 My shirt was drenched in sweat by the time I reached the three spires of the Grand Palace. Mind you, it was just a minute away from the gate. 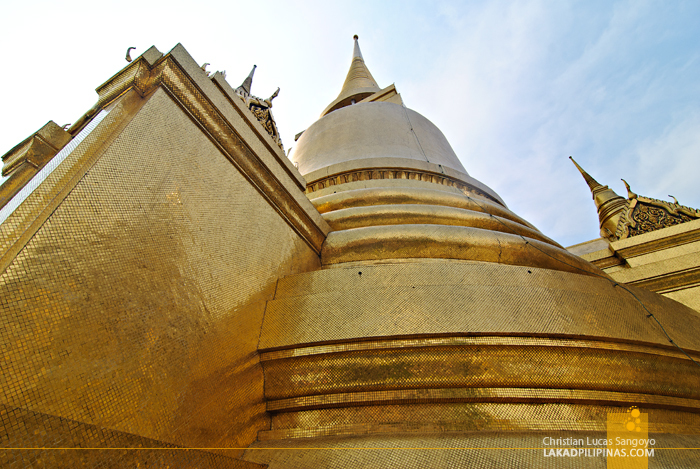 Buckets of sweat and a concert of tourists notwithstanding, I stood in awe as I stood below the shadow of the Phra Sri Rattana Chedi, a golden pagoda several meters high, built in the Sri Lankan style. While I haven’t really been to Sri Lanka and would not know its stupa-style if my life depended on it, I saw two more towering spires after the Sri Lankan one. The next two, I really don’t know what style they were in, but I heard from a passing know-it-all that these represent the evolution of Buddhist influences. 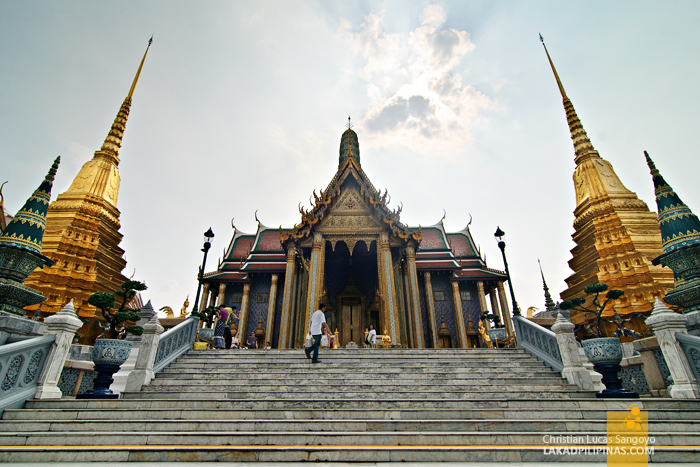 This is, after all, the place where the venerated Emerald Buddha is enshrined. 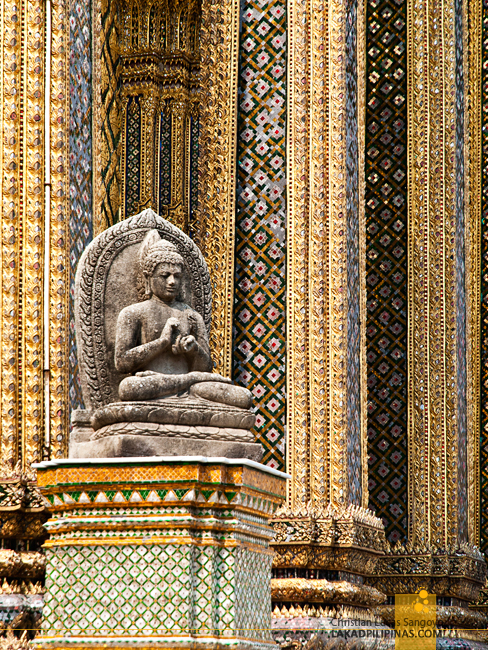 The said Buddha, 26 inches of solid jade, was said to have its origin in 15th century Cambodia. 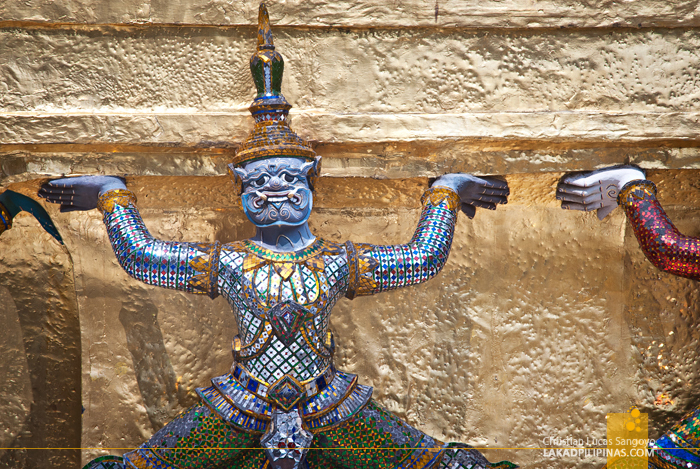 It was then moved to Laos during the 16th century, being stationed in Vientiane for 215 years, before it finally arrived in Thailand. It would’ve been really nice if we got to see the said image, unfortunately the doors to the main temple were closed and more to the point, we really didn’t know that there was such a thing as an Emerald Buddha inside until I read about it while writing this piece. What we knew though was that there were so many buildings inside the complex; its hodgepodge of differing styles, a result of continuous constructions by succeeding kings. I didn’t count, but I read that Wat Phra Kaew, the temple complex inside the grand palace has over a hundred by itself alone. That’s just too darn many for a few hours of visit. 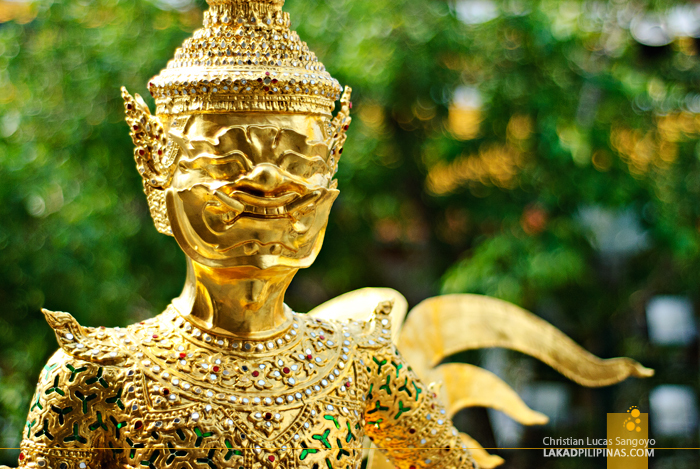 A GOLDEN YAKSHA, THESE ARE NOT MADE OF REAL GOLD, RIGHT? RIGHT? 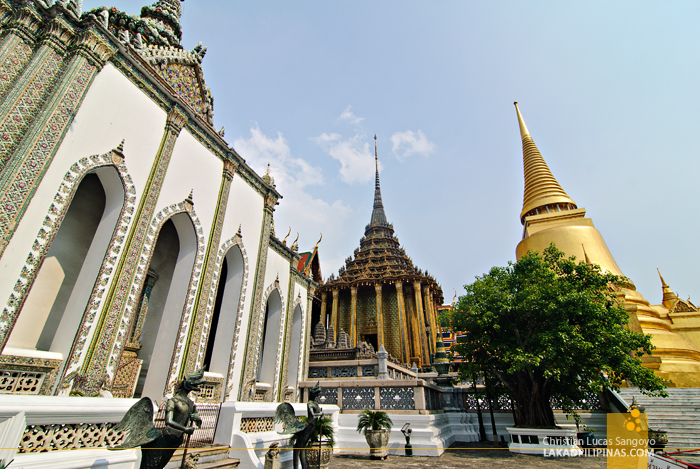 A city within a city as they dubbed it, the Grand Palace was once residences of Thailand’s kings from 1782 up until 1925, when the current king decided to move out along with various government offices and agencies. The place had gotten too small for the needs of the current times. After an hour or so, the crowd began to thin as the heat peaked at three in the afternoon. 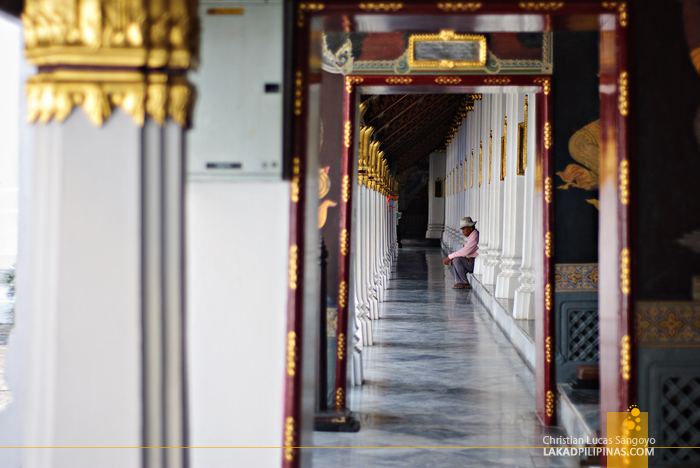 We found solace on an arcade of pillars at the back portion of the temple grounds. We regrouped, with frescoed walls our background, rethinking our strategy for the day. Do we continue with tour, making our 500.00 baht entrance fee worth it, or do we skip the actual palace and head back straight to the hotel and swim at the rooftop infinity pool. We didn’t even have to physically answer. To the pool we all headed. 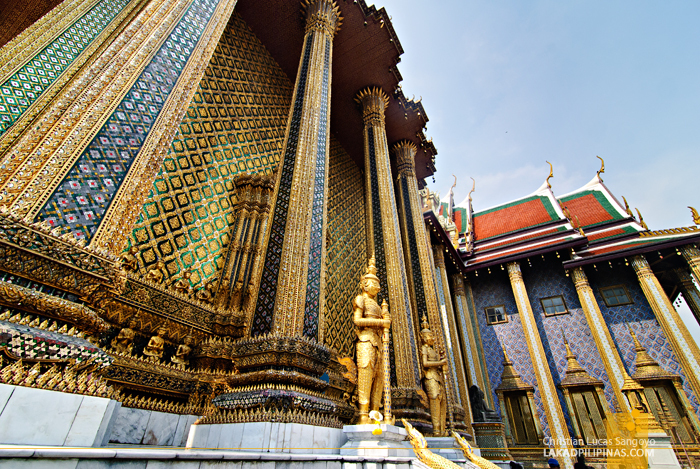 Just to let you know that the Grand Palace will be closed on 1-2 December and 5-6 December 2016.